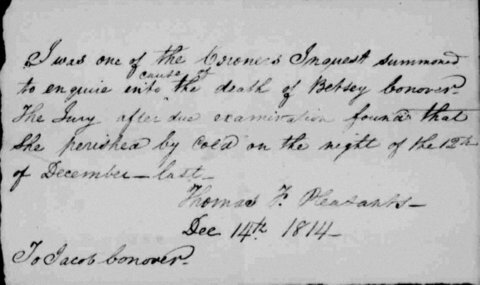 Betsy Conover, 30 years of age, died from exposure to freezing temperatures on December 12, 1814, and was buried at Bethel Burying Ground. Her cause of death was determined by a Coroner’s jury on December 14th. I have not been able to locate any historical records on the Conovers. Many of the desperately poor, in fair weather, would sleep in fields, lumber yards and sheds. However, once winter arrived their choice of shelter was very limited or non-existent. One of the options was to rent a space overnight in a cellar that was pitch black, damp, cold and disease ridden. A viable option if you had the pennies to pay for it. There are numerous reports over the decades of 50+ individuals stacked like cord wood in these wretched desolate pens. (See – Statistical Inquiry into the Condition of the People of Colour of the City and Districts of Philadelphia at http://www.swarthmore.edu/Library/friends/paac1847/censusreport.html. Another option for the homeless was to try to gain admission to the city’s almshouse/workhouse during the Winter and then “jump the fence” in the early Spring. For whatever reason Ms. Conover was not able to do this before she froze to death. For further reading on this subject see – Buried Lives: Incarcerated in Early America, edited by Michele Lise Tarter and Richard Bell.